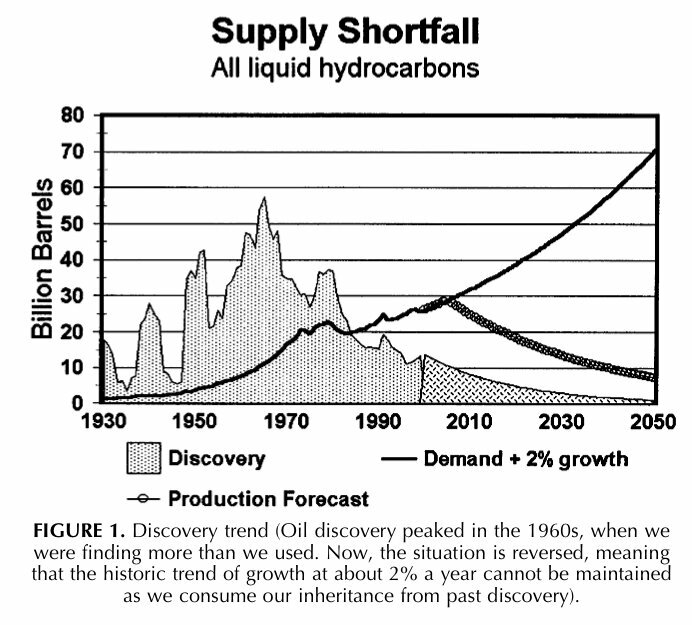 1) The 2002 chart is labeled "All liquid hydrocarbons", while the most recent 2006 chart is labeled "Regular conventional oil" (which is defined by Campbell to exclude oil from coal, bitumen, heavy, deepwater, polar and gasfield NGL). This is an ongoing slow-motion backpedal by Colin Campbell. 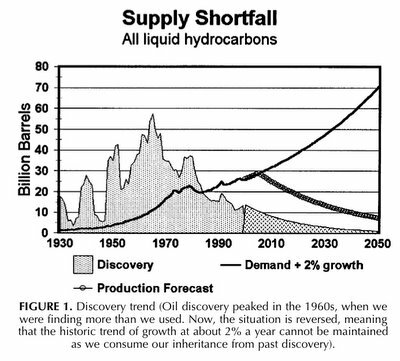 The chart starts as "All liquid hydrocarbons" in 2002, becomes just "The Growing Gap" from March 2003 (when the curve started appearing as a regular feature in the ASPO newsletter) to Dec. 2004, then changes to "Regular Oil" in Jan. 2005, and once again changes to "Regular Conventional Oil" in Jan. 2006. The fact that this chart only applies to a very narrowly defined class of oil, which Colin Campbell calls "Regular Conventional Oil", is a grave problem for the argument here. The chart excludes the "discovery" of, for example, the Alberta tar sands, heavy oil in Venezuela, NGL (which is routinely counted as oil production), coal to liquids, the upcoming surge of GTL projects, ethanol and biodiesel. Coal reserves, for example, ARE oil reserves, as I noted in #43. COAL LIQUEFACTION. So why don't coal discoveries factor into the curve? Or sugar cane ethanol "discoveries"? 2) Also note how the shape of the graph has inexplicably mutated. The 1940 spike, which was about 27Gb in the 2002 graph, has grown to about 35Gb in the 2006 graph. Similarly, the 1950 spike of 42Gb in the 2002 graph has grown to about 55Gb in the 2006 graph. Apparently about 50 new Gigabarrels (i.e. about four Prudhoe Bays) magically appeared from somewhere between 2002 and 2006. This seems to suggest that the whole past curve is in flux. So how can you extend a trend when the thing you are trying to extend is still changing? It is also noteworthy that [Longwell's] past discovery trend is an exact replica, down to the smallest detail, of an ASPO plot published by Campbell in Population & Environment v.24 n2. 2002. Hmmm. Kind of makes you wonder if Longwell just copied the drawing from Campbell's 2002 paper. It's also deceiptful to cite Exxon/Mobil as the source of the data. The paper was written privately by Longwell, an employee of Exxon/Mobil, not by the corporation itself. Despite the fact that this graph is a critical centerpiece of the peak oil argument, NOBODY KNOWS OR EVEN CARES WHERE THIS DISCOVERY DATA CAME FROM. Yes, we have this nice series of crayola drawings, but where did the underlying numbers come from? Longwell's paper is a puff piece which doesn't have any notes. Same for Campbell's puff piece in Population & Environment. Clearly this has the stink of pseudo-science all over it. Genuine scientists do not accept graphs when nobody has a goddam clue where the data came from, or how it is being updated. JD - point taken, but how about you try putting together your own curve, to compare with? 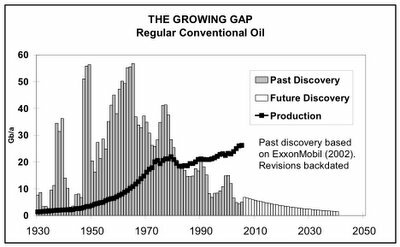 The fact that this chart only applies to a very narrowly defined class of oil, which Colin Campbell calls "Regular Conventional Oil", is a grave problem for the argument here ... why don't coal discoveries factor into the curve? Or sugar cane ethanol "discoveries"? I guess because ASPO wants us to realise we need to start liquefying coal. Still, if the purpose is to let us know when the economy is actually going to be affected by declining oil supplies, they should put in everything. ...yea. Theoretically, if we all captured our farts in a jar, well have another source of "oil" to go with the basket of hydrocarbons at our disposal. Do you both agree, JD & Roland, that if CC should include Gas-to-liquids, coal-to-liquid, biomass-to-liquid along with farts-to-liquid discovery as if they were EXACTLY like normal/ usual/ run-of-the-mill/ old-fashioned conventional oil? Seriously, other forms of liquid fuels may be viable to some degree, but to treat them as "regular conventional oil" discovery complicates the analysis to the point where the issue gets lost in an instant. If CC did include things like CTL in the discovery pattern, then for sure your gripe would be on how much CTL he is accounting for. It's almost impossible to predict how much of that stuff will come online, even if you know exactly how much coal can be extracted and at what rate. Conventional oil is important because is flows much faster than all other liquids. That aside, I think there is some issue with backdating that does call for valid question. The more recent discoveries, and even distant-past ones, don't accommodate "backdated" future additions to reserves. Is backdated discovery patterns useful if we don't have the necessary past to backdate? Theoretically, if we had enough infrastructure, we could pump out liquefied coal and biofuels just as fast, if not faster, than we now pump oil. But we don't, because we don't have the infrastructure. 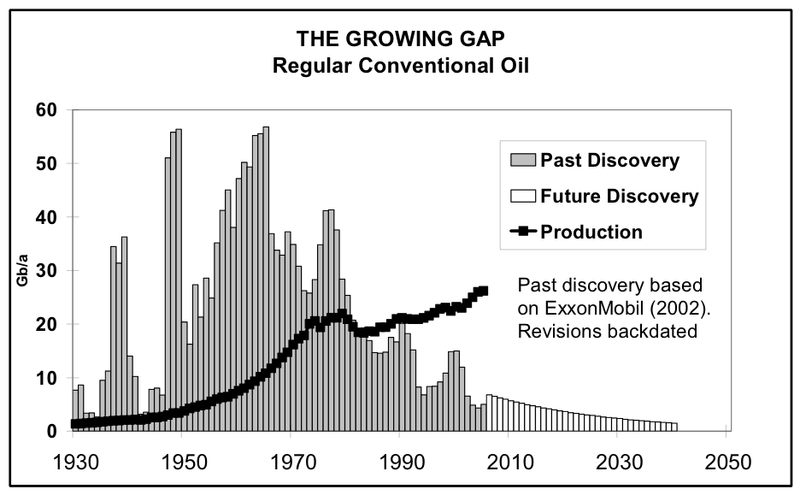 A graph of only conventional oil can be an interesting supplement, but if the key question is at what point in time will we start producing oil at a slower rate, then that graph is always going to be early, perhaps by several years. After the peak it's different, because we'll want to know how much non-conventional oil we have to make to slow the decline. But at the moment, the key issue is when is it going to Peak, and I think what JD's getting at is that without nonconventional oil that answer is not going to be completely accurate. Maybe Chris has a point about Ethanol though, in that you cannot turn sugar cane into actual crude oil, so while a barrel of ethanol might equal a barrel of petrol, it doesn't equal a barrel of oil. JD, how would this be resolved? Hi arthur, welcome to POD. I'd love to make my own curve, or at least analyze the raw data and methodology, but the data isn't available. It would be a big job even if it was. It would be a great step forward if Colin Campbell would disclose his underlying data, but I doubt that's going to happen. At some point I may take Campbell's chart, and Photoshop in some of the most obvious omissions, like the discovery of the Alberta tar sands, heavy, deepwater, the recent Iranian super-giants etc. Consider GTL. Shell is investing $5 billion in a GTL facility in Qatar which will produce 140,000bbl/d of diesel when it is completed in 2011. A barrel of crude, on the average, is 20% diesel. So, in terms of diesel, the Shell GTL plant will be the equivalent of an ordinary crude source producing about 700,000bbl/d. That's quite large -- roughly the same as the oil production of an entire country like Egypt, Australia, India etc. For reference those countries have current oil reserves of about 4 Gb. So, from the standpoint of the diesel market, we could say that the Shell plant is the equivalent of the discovery of an oil field about 4Gb in size. Assuming the entire $20 billion of scheduled investment goes through, GTL in Qatar will be the equivalent of a 15Gb super-giant oil field discovery. That would definitely put a big out-of-trend spike on Cambell's curve. Similarly, in terms of gasoline substitution, worldwide ethanol production is the equivalent of an ordinary crude source producing 1mbd. This is roughly equivalent to the production of Indonesia, which has proven oil reserves of about 4 Gb. So ethanol is equivalent to discovery of a giant 4Gb field, except this is a bottomless field which is renewable and doesn't deplete at all, so it should probably be estimated as a sort of super-super-giant. That would put another out-of-trend spike on Campbell's chart. Yes, you're right that adding alternatives would ruin Colin Campbell's chart -- just like including kerosene would have ruined the whale oil discovery chart. That's why he doesn't include them. But it's a losing battle he can't win. People will call GTL diesel and biodiesel "diesel" because it is functionally identical to diesel, even though it isn't "really" diesel, and the same is true for other alternatives. If you follow Campbell, you'll end up "right" about a pedantic distinction which is irrelevant to the real world. Sort of like one of those old school marm types who scolds you to say "May I have a cookie?" instead of "Can I have a cookie?" 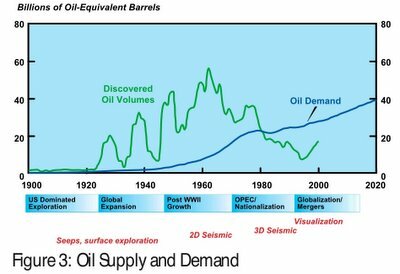 You're right that conventional oil will be very important for a long time to come, but we have to recognize the impact of all liquids, and a good graph should accept that. Yes, it's going to cause a big mess. Everything will need to be rethought, and it will ruin the tidy "Growing Gap" fairy story. But sometimes the theory has to evolve because reality is complicated. Does Colin Cambell seriously not disclose his underlying data? A man is stranded on an island with bread and no water but he survives for 2 weeks long enough to be rescued, how? oh yeah and in the real world ethanol will run in a gasoline engine, "quick and dirty" with a PCM "mod chip" of sorts. and you can re-jet carbureated models for under $50 US. and realistically you could use filtered waste veggie oil for fuel in a diesel in warm climates. no transesterification neccesary. just thought people might wanna know as some believe we'd need an entirely new auto/truck fleet for biofuels. Shell is investing $5 billion in a GTL facility in Qatar which will produce 140,000bbl/d of diesel when it is completed in 2011. A barrel of crude, on the average, is 20% diesel. So, in terms of diesel, the Shell GTL plant will be the equivalent of an ordinary crude source producing about 700,000bbl/d. That's quite large..
How large is 700,000 boe from this GTL project? Conventional oil is important because it flows much faster then alternative liquid fuels. That is why it is the one to watch. That would no doubt cause a price spike resulting in demand destruction, so no, we would not neccesarily have that yearly compounded increase in need. in such a spike scenario wouldn't that make a lot of non-conventional resources competitive? Freak, I did not include a projected increase in demand at 2% in this simple calculation scenario of a deficit in barrel of oil equivalent. I just simply took 4% of 94 mb/d to get the 3.76 mboe/d oil deficit figure for 2011. What this type of back-of-the-envelope calculation shows us is that conventional oil is quite large compared to the reasonable potential of non-conventional sources. As far as you question about how a spike in oil price may make non-conventional sources competitive, well yes and no. Yes there will be some of these to some degree, and no, they won’t exactly become more competitive. Most non-conventional or alternative energies have lower net energy profiles, meaning they take allot of energy for the building of infrastructure and/or as a feedstock. This is typically why alternative energy is alternative. So if energy becomes expensive, low EROEI sources may not be more competitive. Some may become less competitive. And because alternative or non-conventional sources are more expensive, the investment and lead times become enormous compared to conventional oil. This is why the only course for alternative energy is a corresponding reduction in wasteful consumption and the establishment of a steady state economy. In the US that means drastic reductions in car use as we retool the economic & energy paradigm. There is simply no other course except the doom. The good news is that collapse or success is still a choice. I still think whatever the peak date, both alternative and conventional oil is important. It doesn't matter how fast conventional oil flows, because alternative fuels will always make oil peak later. Both graphs are useful, but in different ways. If you want to know when oil will actually begin declining, you need everything that's used as oil. BTW, once a lot of wasteful consumption is done away with, I imagine this would actually help the economy grow because what oil we have will be so much more productive. Doomers produce those stupid graphs of how car use causes prosperity. It's the other way around, stupid! "A barrel of crude, on the average, is 20% diesel. So, in terms of diesel, the Shell GTL plant will be the equivalent of an ordinary crude source producing about 700,000bbl/d." That's not correct. In effect, that assumes that the other 80% is thrown away. In fact, the other 80% is generally as valuable, and could be refined into diesel if that was really desired. Now, the GTL diesel will be very high quality, but overall the Shell GTL plant is equal to oil production of just about exactly 140,000 bpd. Let's say that conventional oil production continues to grow by 2% and peaks by the year 2010 at 94 mb/d. And let's say that the base annual decline is 4% thereafter. That would mean that we would need 3,760,000 boe/d of substitute liquid fuels by the year 2011. According to Colin Campbell, conventional oil production (as defined by Campbell) already peaked in the Spring of 2004, two years ago, at around 65mbd (See #52. 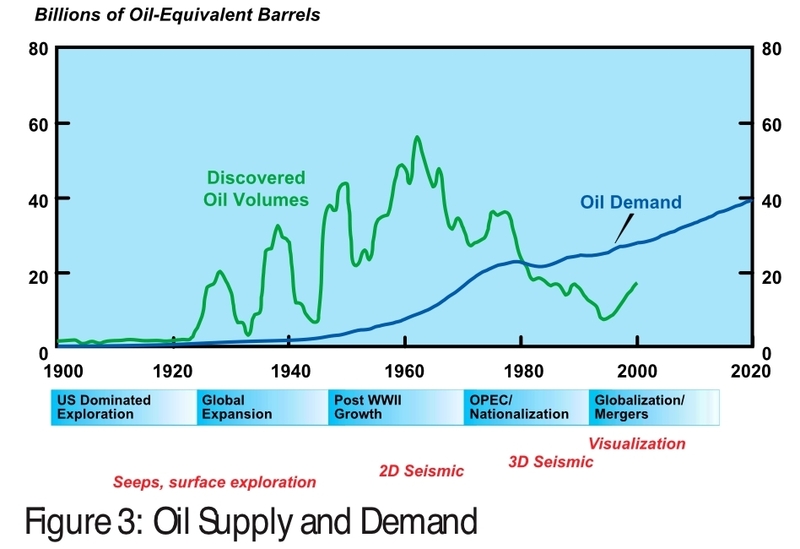 PEAK OIL ALREADY HAPPENED and Freddy Hutter's Trendlines for details.) So, according to your reasoning, we've already lost about half a Saudi Arabia (5mbd) in the last two years. Nevertheless "oil" production has not declined, and in fact has increased by about 3mbd (82mbd->85mbd) since Spring 2004. How do you explain that? Where did all this supposedly irrelevant "oil" come from? No, the Shell GTL plant is equal to oil production of 140,000 bpd + an on-site refinery which converts 100% of that amount into diesel. AFAIK, there are no such facilities in the world today. Therefore, the Shell plant will have an impact on the diesel market numerous times greater than a simple 140,000 bpd crude source. That is the point I am making. Basically, what is happening is that alternatives like GTL and ethanol are side-stepping the entire "crude oil" phase of liquid production, and targeting the retail product markets (gasoline-type liquids, diesel-type liquids) directly. Unlike crude, they are already refined at the primary production site. So the comparison to crude oil just makes things confusing. Look at it this way: the Shell GTL plant will produce 140,000bpd of diesel, but world production of diesel is only about 17mbd (i.e. 20% of 85mbd). 140,000bpd is a lot bigger slice of 17mbd, than of 85mbd. Comparing diesel directly to crude is apples and oranges. For a person operating in the diesel market, there is a huge difference between: there's 140,000mbd of new crude coming on line soon, and there's 140,000mbd of new diesel coming on line soon. Sorry, the last two figures should be 140,000bpd. Seen the price of oil since Spring 2004? And replacing 'conventional' oil by Campbell's tight description with unconventional oil (the other ~20mbpd) was easy. Replacing the declines in the 85mbpd figure is likely to be much harder. so, is the "peak has already past" theory an example of how the market is actively mitigating peak-oil all on it's own, and still remaining in line with inflation if not behind it? also, is not a big advantage of alternatives that they can be produced regionally, and to further that logic wouldn't the reduction in transportation expenses make the EROEI at the pump higher? "For a person operating in the diesel market, there is a huge difference between: there's 140,000mbd of new crude coming on line soon, and there's 140,000mbd of new diesel coming on line soon." Sure. But for the overall oil (and refined products) market, the effect is pretty much the same. All of these products are interchangeable to a great degree in the short term, and entirely in the slightly longer term. Remember, this analysis is in the context of the larger argument about peak oil, and the effect of new sources like GTL. There's a slight loss in the refining step, of course, and the GTL diesel has much lower sulfur etc, but in this context 140K BPD of diesel has pretty much the same effect as 140K BPD of oil. Interesting comments. 2 quick points which I think are distracting from the real point however. First, notice the difference between the 2 graphs...it is quite small. Both are around 30 Gb for 2006 whether you include all hydrocarbons or just conventional. They differ by at most 20% by my eye. More importantly, what is implied but you don't spell out, is the amount by which nonconventional sources have to rise if conventional sources taper off. If you have conventional sources making up 90% and nonconventional only 10%, a 5% decrease in conventional needs to be made up by a 50% increase in nonconventional. Yes, maybe the tar sands can grow by a small amount each year, but 50% year over year to make up for the shortfall of conventional oil is impossible. Too many engineering and technical hurdles. Even the Canadian government only expects 6% annually. The process technology can not expand at this rate. I would appreciate an entry on how you expect nonconventional sources to grow at around 50% year over year to make up for the 5% year over year shortfall in conventional sources. You skipped over that whole argument in this segment. The 50% growth rate is what PO activists are saying is impossible. all discovered liquid hydrocarbons IS THE SAME as conventional oil. You refer to nonconventional oil, coal liquification, bitumen, etc. . . . those are not liquids. Is liquified coal a liquid hydrogen? Yes. But you can't 'discover' it. You discover coal and then liquify it. So your argument is piss poor. If you want to talk about nonconventional oil, fine. But you are undermining your own view by making such stupid illogical arguments as this one.